How much of the island is defined by individual models? IE: the trees, for example. Are they models with unique properties/polygons, or part of the level design itself (like how quake uses Brushes)? Everything except the terrain is an individual object. Each object is created from start to finish by an artist and then it gets placed in the game by whomever is building that area of the envi-ronment. Generally, I, or another artist will get a spec from our designers and we’ll assemble the area by editing the terrain mesh, adding the necessary structures, and planting the trees, ferns, shrubs, etc. Then, it gets passed back to the designers to test and tweak for gameplay. Our environment is very different from Quake’s. In Quake, you’re always in a closed area, where you can see what’s in the room you’re in and maybe out a corridor, or a window to another room beyond that – and if you manage to see outside a level, you get their sky gen-erator. In Trespasser, you see trees, lots of them, and beyond that are more trees, etc. The only thing limiting you from seeing the entire island are natural boundaries (like a mountain) and what distance we decide to set the clipping plane at. With all of these models, how are you keeping the polycount low? Whenever we build an object, we constantly test it in our renderer to make sure we’re not compromising the frame rate. If that starts to happen, we start implementing more of the needed detail as elements of a texture map or bump map rather than geometry. That’s not to say that we only use the bump mapping when we can’t do it in geometry, but if need be, it often times does the trick. Also, as objects get further from the player, we’ll render a detail reduced version of the objects . . . but you can’t tell. How detailed are individual structures? Do they have doors? In many cases, our structures are very detailed because they have to work like real struc-tures. If it has a door, it needs to be able to open or broken down, windows may need to be opened as well. Then there’s all the stuff that goes inside – tables, chairs, etc. any object that Anne may use needs to work just like the real thing. If you take a chair and throw it off the roof of a building, it’s going to break. Than you’ll be able to go down and pick up one or any of the pieces and use it for whatever you want, club a raptor,pry something open…knock yourself out. How complex are the model properties? All objects have properties defined for sound, physics, rendering, and AI. Some are more complex than others. 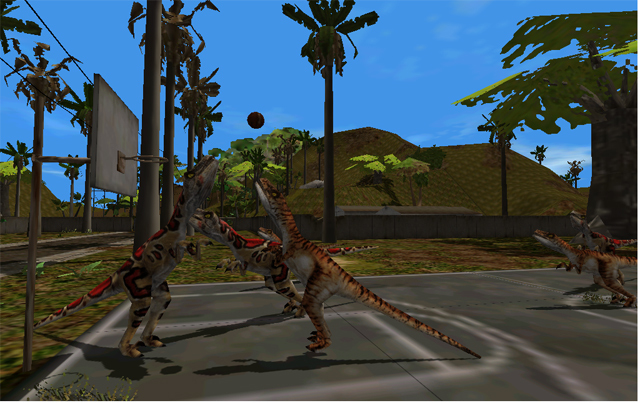 The AI type for a tree or crate is going to be much simpler than that of a raptor. Likewise, tree or structure is going to be more specific in how we want it to render, than a rock. The art team is blessed with a renderer that has a tremendous amount of flexibil-ity compared to other renderers in how we can represent an object – is it flat shaded or smooth? Transparency..sure…bump mapping? OK, but at what strength? How about til-ing…we got some of that too. This may sound a bit vague, but the object properties are as complex as they need to be for us to represent the object correctly in our world. When you create one, are you defining individual properties like weight? Yes. We define all the sound materials, physics properties, AI types, and rendering proper-ties as mentioned above. However weight (particularly) is defined via a density setting. Be-cause we know the scale of every object, weight can be determined by looking at it’s density. That way, we can create a large rock and a small rock and they will have the same density, but will act differently in the world because their scales (and therefore, weight) are different. Are you defining health for objects (so that there are varied levels of damage that an object can take)? Yes and no. Anything animate has health, most notably, Anne and the dinos. As far as ob-jects go, not really. A leg of a chair or table may need a certain force applied to it to break off, but it won’t break if you stand there and tap on it all day. Which do you find harder to design, buildings, or outdoor areas? Outdoor areas are much more difficult to implement. When you make a building, you know it needs walls, a floor, and a ceiling. When you create terrain and do tree placement, you have to think about how it was formed over time, and what weather has done to it. Water runoff channels, and other ruts in the terrain are very important to us. I noticed that you wrote two books on 3D Studio. How psyched were you by the possi-bility of directly importing 3DS files? I was extremely psyched about taking my models directly from 3D Studio MAX to our ren-derer. We have a very easy process for getting our objects into our renderer from 3DS MAX. A custom plug in w wrote takes the entire contents of the scene and exports it directly to our file format for loading into the game. We can even run the game in the background while ed-iting the models in MAX and painting maps in PhotoShop and Painter. On average, how complex is a model? IE: how many sub-objects does it contain? If the model needs to break, then it can get pretty complex because we have to pre-break it, and put it back together so it looks like it isn’t broken. If we’re building a rock, or a 2×4, things are dead simple, 1 object and 1 sub object. When creating a model, do you have to define the properties of each sub-object, or is it an inherited trait? Each sub object is really a separate object, defined to be grouped with some other objects until broken off or otherwise separated. That in mind, each sub object can have totally unique properties. Can you tell us a bit about your proprietary editor? The two screenshots that were re-leased were very intriguing. We load our exported files from MAX directly into it and profile them for frame rate, memory usage, and of course, visual quality. We can turn on and off most every rendering parameter of an object as well. It’s mainly a tool for the artists to pre-visualize stuff before it goes into the game. How “blocky” are the Trespasser models are in comparison to Quake. Could you shed a little light on the subject? Looking at the quake model (not environment) data sets, we’re actually a little lower in poly-gon count to theirs for comparable size models. We are able to use less polygons because our bump mapping doesn’t need a whole lot of detail to represent a smooth surface. In fact, the smoothing on some of our models looks like s__t in MAX, but represent great in the game (which, of course, is the only place that matters). Lets talk a little bit about bump mapping. First off, at what point did the idea to inte-grate it into the engine come about? I believe it was in the plan from before I came onboard with the team. At QuakeCon, John Carmack said that he was planning on integrating it into id’s next generation engine Trinity, however his description made it sound like they were using it in place of alpha blending; Ex: as you get closer to a wall, for example, the wall shows individual bricks. Does Trespasser use it in this limited way, or is it more fully exploited? We exploit the hell out of it. You’ll be able to walk up to any tree on the island and see nice, smooth, but bumpy bark. You’ll get concrete that has cracks in it, rusted patches of metal on old vehicles, dinosaurs (of course). Even Anne uses bump mapping. What do you think overall about the decision to use bump mapping? Making it an in-tegral part of the game does mean sacrificing hardware support. Do you consider this to be a good decision overall? Yes, I do. I don’t think that Trespasser will be any less playable because of a lack of hard-ware support. Do you find the small poly-count on the models in trespasser limiting? Not really. When I first started on this project more than a year ago I did, but I was just com-ing from projects like Zork Nemisis where everything was pre-rendered so the poly count didn’t matter. Do you have any advice to offer to the would be professional 3D Modeler? Sure – become VERY familiar with your toolset (software) and learn everything you can about it, because after a while you’ll start to see ways you can exploit it to do things you thought you couldn’t do before. If you find it more helpful to sketch out what you want to model before you sit down at your computer, do that – I, personally, am much faster at modeling something in 3d to begin with rather than sketching it out. Try this exercise: go around your house and pick up 5-10 interesting objects – then model them. If’ you’re struggling with the software, try to model something you’re interested in – a certain car, your house, your girlfriend, whatever. Who’s the best Quake player on the Trespasser team? Brady and myself are probably a close tie. If you could integrate one single thing into the Trespasser engine, what would it be? Hierarchical procedural shader trees would be killer.